A touchstone for cinematographic greatness and the possibilities of screen acting, as well as an "instant classic" of the boxing-movie genre. 129 min. United Artists Films. Director: Martin Scorsese. Cast: Robert De Niro, Cathy Moriarty-Gentile, Joe Pesci, Joseph Bono, Lori Anne Flax. Over thirty years since its release, Raging Bull has lost none of its power to astonish. Director Martin Scorsese brought unparalleled lyricism and a daringly bleak tone to this unusual studio production. The film also marked Scorsese's fourth collaboration with Robert De Niro, the preternaturally gifted actor for whom Raging Bull was an ultimate passion project. The film wound up being a touchstone for cinematographic greatness and the possibilities of screen acting, as well as an "instant classic" of the boxing-movie genre. Based on the book by middleweight fighter Jake La Motta ("with" Joseph Carter and Peter Savage), Raging Bull tells the story of the bruiser known as The Bronx Bull. While Scorsese shows a keen interest in projecting the objective experiences of participating in and watching boxing, its primal pull, Raging Bull is as much a story of Italian-American domestic life, albeit an extreme example of same facing the added pressures of fame and an income based on physical endurance. What makes Raging Bull so special is the director's determination to achieve emotional and physical intimacy in the process of telling a story that's already naturally heightened by its larger-than-life concerns. With his fight camera, Scorsese takes us in close (to the ring and the cramped apartment), and it's nearly too much to bear. La Motta's rage is his best asset in the ring—as when he pummels Janiro in the face after La Motta's wife Vickie (Cathy Moriarty) blithely refers to him as "good-looking" (as Nicholas Colasanto's Tommy Como cracks, "He ain't pretty no more"). Naturally, that rage is Jake's worst enemy outside of the ring, where it fuels his insane jealousy, paranoia and anhedonia (casual racism and sexism are also pernicious parts of his world). All of his personal relationships are turbulent, but particularly those with the ones he loves the most, long-suffering Vickie and La Motta's younger brother Joey (Joe Pesci), volatile personalities in their own right. As much as Raging Bull is the story of a boxer making his way, it is a tale of two brothers, driven apart by La Motta's ironically self-destructive defensiveness. The unconventional plotting by screenwriters Paul Schrader (a lifelong student of masculine neuroses) and Mardik Martin captures snapshots (sometimes literally) from La Motta's life—and Scorsese includes "home movies." The story charts the course of the boxer and the man's gradual decline, memorably arriving at a bloated La Motta's lonely stint doing stand-up comedy as a nightclub emcee (including a recitation from On the Waterfront: "I coulda been a contendah"). For all of La Motta's awfulness as a man, the scene evokes a powerful sympathy at a tragic hero whose fate was to bring himself so very low. 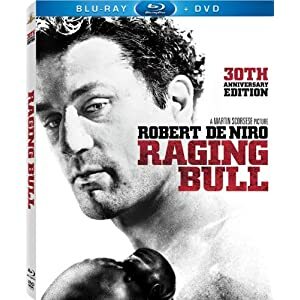 MGM's 30th Anniversary Edition of Raging Bull comes with the same mighty A/V quality and bonus features as the previous Blu-ray edition, while adding four new featurettes in HD. The black-and-white cinematography looks terrific in HD, with excellent contrast and natural film grain (there is a hardly noticeable, intermittent, translucent vertical band that occasionally appears on the right side of the frame, but most properly calibrated TVs won't even display it, so no worries). Audio comes in a DTS-HD Master Audio 5.1 mix that definitively upgrades the original sound design to modern specs (There's also a Dolby Digital 2.0 option). The first new bonus, "Marty and Bobby" (13:35, HD), is a fascinating sit-down between Scorsese and De Niro. "Raging Bull - Reflections on a Classic" (12:15, HD) finds directors Kimberly Pierce, Richard Kelly, Scott Cooper , and Neil LeBute discussing how the film inspired them as filmmakers. In "Remembering Jake" (11:04, HD), members of the Veteran Boxers Association of New York discuss their recollections of La Motta. "Marty on Film" (10:30, HD) is a Scorsese interview focused mostly on his early years as a film enthusiast and rising director. Archival bonuses include an essential commentary by director Martin Scorsese and editor Thelma Schoonmaker and cast & crew commentary with producer Irwin Winkler, Robbie Robertson, producer Robert Chartoff, Theresa Saldana, John Turturro, sound effects supervising editor Frank Warner, DP Michael Chapman and casting agent Cis Corman, as well as a storytellers' commentary with screenwriters Mardik Martin and Paul Schrader, Jason Lustig and Jake LaMotta. "Raging Bull: Before the Fight" (26:01, SD) focuses on Robert DeNiro's passion, the development of the script, the film's funding, and casting, with comments from Chartoff, Winkler, De Niro, Scorsese, Martin, Schrader, Joe Pesci, Cathy Moriarty, and Frank Vincent. "Raging Bull: Inside the Ring" (14:45, SD) covers production and photography with Scorsese, Pesci, Chapman, Schoonmaker, and De Niro. "Raging Bull: Outside the Ring" (27:24, SD) addresses personal memories and discussions of character and theme, with Scorsese, Winkler, Pesci, Schoonmaker, De Niro, Moriarty, Chapman, Vincent, and Chartoff. "Raging Bull: After the Fight" (15:22, SD) deals with the film's violence, sound effects, music, editing, reception, and what the film means to the talent involved. Participants include Scorsese, Schoonmaker, Pesci, De Niro, Warner, Winkler, Chartoff, Moriarty, and Chapman. "The Bronx Bull" (27:54, SD) includes interview footage of La Motta, Schoonmaker, film critics Ian Nathan, Derek Malcom, Ben Ollins and Andrew Pulver. "De Niro vs. La Motta" (3:47, SD) intercuts Scorsese's footage with archival footage of La Motta. "La Motta Defends Title" (1:00, SD) is a brief Movietone Newsreel. Lastly, we get the "Original Theatrical Trailer" (2:09, SD). This is an outstanding special edition of one of the all-time great American films: cinephiles won't want to live without it. All site content © 2000-2019 Peter Canavese. Page generated at 04/21/2019 04:17:36AM.